Oh! I think I got it a little. I don't need to send data to any NXT account, but just to blockchain. Normally one should have a look at that API's source code and you'll have the best available view of how to use it. But I have no idea when any of that will be made public. Not sure how familiar you are with the topic, so this might be known already. 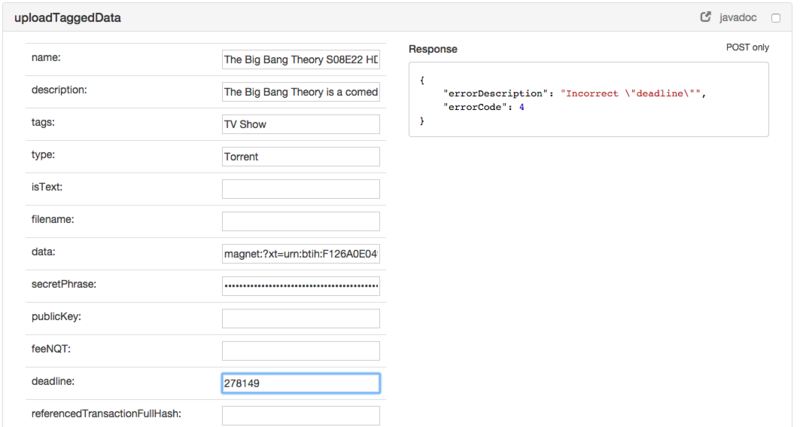 But there is a test page that is auto generated and shows you editable fields for all available API's. Lol. I see it now. If anybody could help please? So, do we have any news/confirmation if anybody started working on this? Yes, I've started work on it and progressed nicely so far. I'll post a first update/preview in the course of next week. - There's a specific NXT account/address which receives Torrent data related messages. - Joe sends a message to a NXT account with message which includes the torrent magnet link, torrent related tags (helps categorise it), description, image links to third party sites etc. Except that the tagged data transactions don't have a recipient. Also the data doesn't have to be a magnet link, it can also be the content of a torrent file, which is just another way of doing the same thing. - Alice downloads this script/page from internet (another torrent site, filesharing site, github etc. ), opens it in local browser, browse through the torrents found on NXT blockchain and downloads the torrents she wants. Yes, and this script is a Nxt plugin which can be accessed directly in the client. Also, there won't be any image thumbnails by default, but the uploader can link to them in the description. I don't think you should use the plugin system for this. Nothing usable will come of it. Good to hear from you toenu! Will be looking forward for your update! I bet it would be even better if the bounty was a little more than 25K NXT (yes that is a hint).